Sprout is a Farm-to-People festival that brings growers, producers and the community together. More than just a farmers’ market in the city, the inaugural two-day festival celebrates sustainable agriculture, urban farming and good honest food. We visited Sprout 2018 this morning to find out more about the various sustainable food that are being offered at the festival. There are an impressive range of over 55 specially curated local exhibitors ranging from farm growers, urban farming, artisanal and speciality food available. 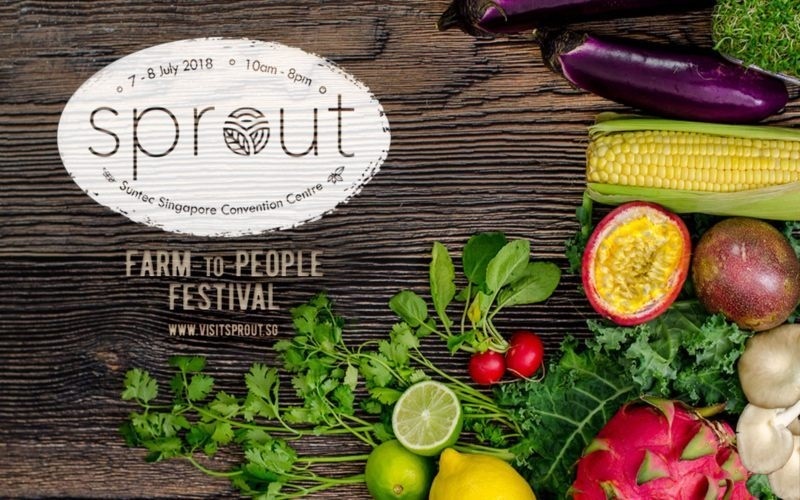 Sprout is Singapore’s largest farmers’ market and it is the first-of-its-kind event that is held at Hall 406 @ Suntec Singapore Convention Centre from now till tomorrow, Sunday, 8 July. There will be an exciting line-up of sessions across six zones – namely, Sprout & BUY, Sprout & EAT, Sprout & COOK, Sprout & GROW, Sprout & PLAY and Sprout & LEARN. Admission is free and a great place to bring the whole family to spend the day at the festival. Find out how you can grow your own mushroom at Mushroom Kingdom. Check out the honey range at Meliponini Honey which is produced by stingless bee species, Heterotrigona Itama, which comes from the Land of Hornbill, Borneo, a region known for its rich tropical rainforest. Move to the Sprout & EAT section where you can indulge in a wide range of fresh food, we tried out the Wuting Healthy Gourmet Vegetarian Bao, simply delicious and healthy! Enjoy delectable desserts like Handcrafted Gourmet Marshmallows at The Wicked Cream Co.
Bring your family and friends to visit Sprout 2018 – Farm to People Festival from now till 8 July 2018! Whether you are interested in sustainable food and living, love fresh produce that you can purchase directly from farmers and producers, an urban farming enthusiast, a health-conscious foodie or just looking to support local brands – this two days festival is one not to miss!